Use either macaroni or spaghetti; prepare the sauce as for No. 1; season to taste with salt, pepper and butter; make rich with tomatoes (either fresh or canned) cooked to a pulp; put the mixture, layer by layer, into a baking dish, grating a thin layer of cheese over each layer, covering the cheese with buttered bread crumbs; return to the oven and bake 25 minutes. Scald; peel and cut into small pieces; cook quickly, stirring frequently until free from lumps; add 1/4 cup of sugar or sweeten to taste; two tablespoons butter; 1/2 teaspoon salt; 1/8 teaspoon pepper; a small onion sliced and a pod of green pepper. Cook slowly for ten minutes more and serve hot. Select firm, well-ripened tomatoes; remove stem end; take out about two-thirds of the pulp; mix the juice and pulp with the filling; for six tomatoes allow 1/2 cup of cold meat or fish chopped fine; add 1/2 cup of mashed peas, beans, grits, rice, potatoes or soft bread crumbs, 1 onion minced fine or parsley, celery, etc. Salt and pepper to taste; fill the cases; cover with well buttered bread crumbs; place them in buttered pan, and bake from 20 to 25 minutes in a moderate oven. Cut in halves; lay them in buttered pan; cover with buttered bread crumbs, and bake till brown. Peel and chop to a pulp one pint of very ripe tomatoes; or one can will do, add 1 qt. milk; 1/4 teaspoon pepper, sprig of parsley, 1/4 teaspoon soda, 1 teaspoon salt, 2 tablespoons butter, 1 teaspoon sugar, 1 tablespoon flour. Add all of the flavorings to the tomatoes, and cook for 10 minutes; rub through a colander; heat the milk to the boiling point; thicken with flour and butter rubbed to a paste; reheat the tomatoes and add the soda; stir all together and serve at once with bits of toasted bread. Cook for 10 minutes one pint of tomatoes peeled and chopped or canned; put through a sieve; melt 4 tablespoons butter; rub in 4 tablespoons flour; add 1/2 teaspoon salt, 1/8 teaspoon pepper; add the tomato, and cook until it thickens. Peel and slice 1 quart of tomatoes (or use one 3-lb. can). Remove seeds, and cut in small pieces 3 bell peppers; boil till tender 4 onions; add tomatoes and peppers to onions, and simmer 1 hour; season with 2 level teaspoons salt and 1/2 teaspoon black pepper; cool, and keep on ice for several hours. Prepare two cups of stale bread crumbs; take 6 tablespoons of butter, lard or Wesson Snowdrift oil. Fill a baking dish with alternate layers of tomatoes and bread crumbs; moisten each layer with oil; cover top with bread crumbs, and bake in a slow oven for 1 hour. If desired, three tablespoons of sugar may be added to the mixture while it is cooking the first time. Scald and skin the desired number of tomatoes; remove hard ends and cut into small pieces; stew in porcelain stew-pan till tender; add salt, pepper, and sugar to taste, also one teaspoon butter to each pint of pulp; thicken with coarse or fine bread crumbs, or thicken with a little flour dissolved in cold water, or serve plain as desired. Take 1 peck of thoroughly ripe tomatoes and cook slowly, without water, until tender; rub through a colander; return to the fire and boil until thick; stir almost constantly to keep from burning. Now add 1 pint of vinegar, 1 pound of sugar, 2 tablespoons black pepper, 1/2 teacup of salt, 1/2 tablespoon Cayenne pepper. Boil again until thick; pour at once into well-sterilized bottles, and seal or cork tightly; set in a dark, cool place. Take 1 pint of fresh or canned tomatoes, 2 pounds of lean beef cut into small strips, 3 large onions, sliced, 2 tablespoons drippings, 1 pint of shredded cabbage, 7 small potatoes, 1 teaspoon salt, 1 teaspoon paprika, 1 cup of water, and 1 cup of milk. Place the drippings in a kettle; when smoking hot, add the meat; when the meat is brown, remove from the kettle, and put in the onions and cabbage; then put in the meat and the tomatoes; add the seasonings and the water; cook very slowly until the meat is tender; then add the potatoes; when they are done, add the milk; boil up once and serve. Select nice large tomatoes; peel with a sharp knife; make a cavity in the end of each, and press a piece of cheese into each one-press three or four small pieces into the sides of each tomato; press a bit of butter into each; salt and pepper the tomatoes to taste, and at the side of each one lay a piece of cheese the size of a walnut. Cover with bread crumbs; bake in a moderate oven 1/2 hour if the tomatoes are medium size and 1 hour if very large; baste them several times with the liquid that forms. Little water is needed, as they will form their own liquor. When done, brown them nicely on the top and serve at once. Take one pint of canned or finely chopped fresh tomatoes, one cup of water, one teaspoon of chopped green peppers, two tablespoons sugar, one teaspoon salt, two level tablespoons butter, the same of flour; strain the tomatoes, and rub the pulp through a sieve; add the water, pepper, sugar, and salt, and put over fire; rub the butter and flour to a smooth paste, and stir into the tomato stock as it heats; boil five or ten minutes, and serve with bits of toasted bread (croutons). Use 1/2 can tomatoes, 1 tablespoon flour, 3 cloves, 2 tablespoons butter, 1/4 teaspoon black pepper, 1 bay leaf, 1 teaspoon chopped parsley, 1/2 teaspoon salt, 1 tablespoon chopped onion. Place 1 tablespoon of the butter in a saucepan; add the flour and cook 5 minutes, stirring constantly; then add the tomatoes, salt, pepper, bay leaf, and cloves; cook until thick and smooth; add by little pieces the second spoonful of butter; cook slowly for 5 minutes longer; strain and serve. Season two cupfuls stewed tomatoes with salt, butter, pepper, and one onion sliced thinly; break six or more eggs into the cold tomatoes; cover with bread crumbs; drop bits of butter freely over the top; set in the oven and bake until the eggs are set; serve with boiled rice or macaroni or hot, dry toast. Cut the beef steak in convenient pieces for serving; season with salt and pepper; roll in bread crumbs; put at once into a hot frying pan, in which are two tablespoons of butter and drippings mixed; brown quickly on both sides; pour over the steak two cups of boiling hot, well – seasoned tomatoes; cover and cook in a hot oven until thoroughly done. Select nice pork chops, and proceed exactly the same as recommended for beef steak (No. 21). Prepare enough nice, ripe tomatoes to make one quart when stewed; cook with them one small onion, a few cloves, and two tablespoons of sugar; cook thoroughly; strain through a sieve; season to taste with salt, and pepper. To one-fourth cupful of butter, bubbling hot, add one-half cupful of corn starch; to this add the tomatoes you have already prepared with onion, cloves, and sugar, stirring them in gradually: cook about three minutes or until blended; then add one egg slightly beaten. Put this in. a shallow buttered tin, and when cool cut into squares; roll in bread crumbs, egg, and then crumbs again, and fry in deep fat; drain before serving. Wash, peel, and stew the required amount of tomatoes until rather thick; add salt. and pepper to taste, a generous lump of butter, one teaspoon , sugar; split the grains and scrape the corn from six ears, or aim to get just as much corn as tomatoes; cook until well done; serve hot. Brown carefully in a sauce-pan one tablespoon butter and the same of minced onion; when a golden brown add a quart of peeled and chopped tomatoes; cook thoroughly; pass through a sieve to remove the seeds and hard lumps. Add the tomatoes to two quarts of beef stock; when boiling hard, add 1/2 cup of rice; cook until the rice is soft; chop up very fine or run through a meat chopper some of the meat and add to the soup; season to taste with salt and pepper. the bottles in a kettle of water like any other preserve; boil for 15 minutes; cool, cover, and set in a cool, dark place. It may be put boiling-hot into sterilized glass jars, and sealed the same as any fruit jar. In this way it will keep indefinitely. Cut the stem end off the tomatoes; remove the core and seeds, and fill with the following mixture: Add the bread crumbs, cheese, and two of the eggs boiled hard and finely chopped, a dessert spoon of finely chopped herbs (basil or savory); pepper and salt to taste; mix well with the other two eggs well beaten; fill the tomatoes with the mixture; cover the top of each tomato with bread crumbs mixed with finely chopped parsley; put a small piece of butter on each, and put on a greased baking pan; cook in a slow oven for 20 or 30 minutes. Cut both stem and blossom end from large, green tomatoes; cut in thin slices; roll in flour, and fry in hot butter. Sprinkle with salt, pepper, and a little sugar; cook until brown. A little onion may be fried with them if desired. Cut in thick slices as many thoroughly ripe tomatoes as desired; fry until tender in hot butter, and then set on a hot platter in the open oven. Stir a tablespoon of flour into the butter in the pan until well blended. Let it cook until creamy; then stir in a cup of very rich milk, in which a pinch of soda has been dissolved. Stir and cook to a smooth sauce; season with salt and pepper to taste, also a little curry powder if you wish; pour over the tomatoes and serve. Take 1/2 peck of green tomatoes, half as much each of onions, and hot, green peppers; peel the tomatoes and onions, and chop fine. Cut the peppers, removing the inner white skin, and chop, leaving in the seeds; add one cup of salt, two cups of sugar, and one quart of vinegar. Boil the mixture for about three hours, or until it thickens a little; pour into well sterilized bottles, and seal hot. Cook one hour, bottle and seal. Put the chopped tomatoes in a bag and let drain 24 hours; add the celery and the onion; mix thoroughly; add the salt; add all the other ingredients; mix very thoroughly; cover with good strong vinegar; put in glass jars and seal. Select medium sized tomatoes, one for each person to be served; wash, and dry carefully, cut off the stem end of each, and remove the pulp with care; cut the pulp and one whole tomato in small pieces (do not chop). cut. one onion in dice, and a small stalk of celery in small pieces. Mix the onion, tomatoes and celery together lightly but thoroughly stuff the tomatoes with the mixture, and serve on crisp lettuce leaves with a generous spoonful of mayonnaise dressing heaped on each tomato. This is a delicious salad, and very appetizing in appearance. Put spice in a thin bag; put all the ingredients together, and boil until quite thick, stirring frequently to keep from burning. Butter a baking dish; put in a layer of tomatoes; sprinkle with sugar, and cover with rice and peppers. Alternate the layers until dish is full, having the tomato on top. Dot with the butter; bake (covered) three-fourths of an hour; uncover and bake for quarter of an hour longer, serve hot. 2 tablespoons of butter (heaped) or a cup of left-over gravy, or two cups of chicken or beef stock. Thicken with a tablespoon of flour mixed smooth with cold water; mix all together; season with salt and pepper to taste; cook one-half hour; serve hot with sippets of toasted bread. Toast rounds of bread; sprinkle generously with grated cheese; put a slice of tomato on each round, and two slices of bacon on top of the tomato; bake in quick oven until bacon is crisp. Chop onion; cook for 5 minutes in butter; add peppers, finely chopped, then add the tomatoes and seasoning. Simmer for 15 minutes; then put in thin slices of whatever meat you wish. Cook all together for a few minutes. Boil 1/4 package of spaghetti, having water boiling and well salted when it is put in; cook until tender; drain off the water, and pour tomato sauce over the top. Mix all together and let boil for five minutes; strain and return to the fire; add 3 cups milk, 1/2 cup of cream, 1/4 teaspoon soda, and boil one minute; serve at once. Cut the tomatoes fine, and stew in water 20 minutes; rub through a puree sieve. Add the puff-balls diced, the salt, and the paprika, and simmer for 10 minutes. Add the butter, and serve very hot. The puff-balls should be about the size of medium potatoes. All varieties are wholesome and delicious if eaten when the flesh is as white as curd. Add a few more dry, buttered bread crumbs. cut off the tops of the tomatoes; scoop out the centers; add the other ingredients except the shrimps. Heat the butter boiling hot; fry the shrimps; then add to the tomatoes; fill the tomatoes with the mixture; dust the tops with the buttered crumbs, and bake 20 minutes in a moderate oven. Select firm, ripe tomatoes; cucumbers to make the same number of slices; half the amount of onions; slice and arrange artistically on crisp lettuce leaves; sprinkle minced green sweet peppers over all; chill; when ready to serve pass French or mayonnaise dressing. Put all the ingredients into the soup pot, and cook gently for two hours; then add two tablespoons butter or sweet drippings, and serve. The bones from roast meat or broiled meat adds to its flavor. Mix all the above ingredients; put two tablespoons cotton cooking oil, butter, or lard into a frying pan, add mixture of seasoning, and when hot put in the tomatoes, and cook until tender; serve hot. 2 pounds of cheapest cuts of beef cut into small pieces. 1 onion sliced and fried with the meat, in butter or drippings, until the meat begins to turn brown. Put a layer of the meat in the kettle; cover with a layer of the thinly sliced onion; continue this way, alternating the layers of meat and onion until all the meat has been used; cover with cold water, and gradually bring to the boiling point. Turn in two cups or its equivalent of canned or fresh tomatoes, but do not stir; simmer for two hours, tightly covered; then add some potatoes cut into thick slices or chunks; salt and pepper to taste; cook until meat is tender, and serve hot. Melt the butter in stew kettle; turn in the rice and cook five minutes, stirring all the time; now add the stock, tomatoes and seasoning; boil one-half hour; turn into a baking dish, and bake 25 minutes in a moderate oven; serve hot. Put roast into a suitable pan; pour over it one cup of boiling water; let remain on the stove until it begins to boil; pour over this a large can of well seasoned tomatoes; bake in a medium oven until done, which will require about three hours. Place all but the vinegar in an open mouthed jar; scald the vinegar; when cool pour over the mixture. The vinegar must just cover the mixture. If it does not, scald more and add to it. Stir every day for ten days; then set aside in a cool place until needed for use. Chop vegetables; sprinkle with salt, and let stand over night; press out the water, and drain in the morning. Mix all the other ingredients; mix thoroughly; in small jars; cover with vinegar, pack and seal. It spoils rather quickly after opening. 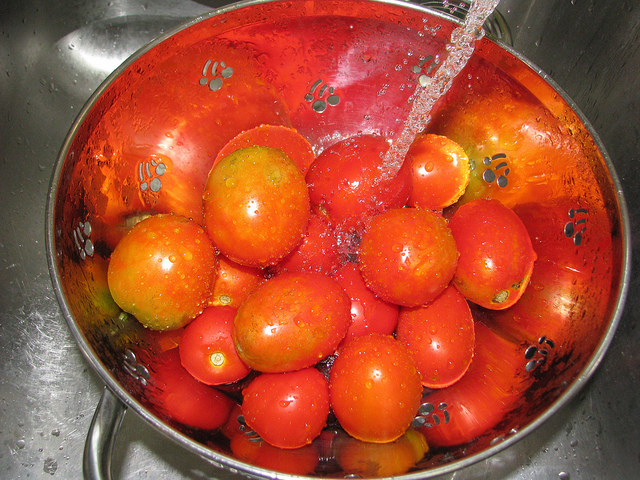 Use 1/2 bushel of ripe tomatoes, washed and mashed to a pulp; put in a porcelain lined kettle with 2 tablespoons salt; boil until tender; cool, and mash through a sieve. Take 1/2 gallon of the thin juice; add 2 pounds of sugar, one tablespoon each of whole cloves and black pepper, six blades of mace, a short stick of cinnamon, and a root or two of ginger. Let this boil until well flavored with the other spices; then strain, mix with the other juice, and boil until thick; add 1 quart of apple vinegar; boil 15 minutes; bottle and seal. Ordinary fruit jars may be used. Keep in a cool, dark place. It can be used immediately, but improves with age. Boil all together slowly for 1 hour; cool, and bottle for use. ← A Harvest Too Soon?? ?